You are an explorer, running through a maze, trying to get keys and other objects that will allow you to get the treasure and exit to the next maze. Two-joystick game — one for movement, one fires right and left ONLY. Also has “flash” bomb — like smart bomb. A unique game but very difficult! In this game, you play an explorer who searches through King Tut’s tomb to find his treasures while fighting off various creatures who guard the tomb as you find your way through the catacombs. You must guide the explorer through the maze of each stage. There are several different creatures who constantly materialize from random areas of the maze and attack including asps, vultures, parrots, bats, dragons and curses. Those creatures can be destroyed to score 20, 40 and even 60 points with bullets or a “flash bomb” which destroys all enemies on the screen. “flash bombs” can only be used once per stage or each of them can be used for later stages. On each stage, the explorer must pick up keys worth 500 points each in order to unlock the doors worth 1000 points eachto the rooms where each of the treasures are kept but he can only carry one at a time. The first stage only has two doors to unlock but the other three each have three doors to unlock. The explorer can also collect rings and crowns from random parts of the maze that are worth from 500 to 4000 points each. There are also “warp zones” located in random parts of each maze that allow the explorer to be teleported from one area of the maze to another. Each maze has a map at the top of the screen that helps you know how far the explorer is from each treasure room. 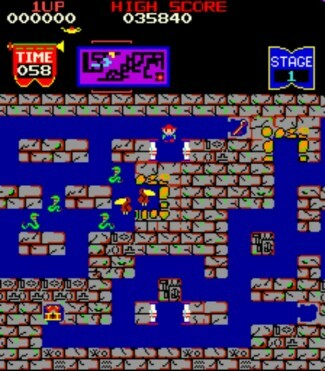 Each stage has has a time limit and if you run out of time, you will run out of bullets, so you must try to collect all keys and unlock all doors to recover the treasure before time runs out. Once the explorer has unlock all doors and recovered a treasure, a bonus score is rewarded for the treasure. Points are also scored the time that is left over on each stage. Afterwards, the explorer proceeds to the next stage. Each treasure has different point values. You get no points at all for the map, but you get 1000 points for the urn, 2000 points for the chest of gold and jewels and 5000 points for the golden death mask. After you have recovered all four of King Tut’s treasures, the game starts over again with increased difficulty.